Hungry for a snack and thirsty for fresh juice, my friend and I decided to venture up north for a snack prior to kayaking. After riding around on our bikes for a half hour or so, we arrived at Rojo Beach Lounge – a waterfront bar/restaurant located approximately 5 miles north from the heart of San Pedro. (I still smile at the fact that no one uses addresses, just distances from downtown San Pedro.) We took a seat at the bar, ordered some Caribbean-inspired food, and pinched ourselves. Nope, this is not a dream. The azure waters and sandy beaches still continue to awe me. After a few tasty drinks and a good chat with our bartender, we decided to continue our exploration up north. We were enjoying the serenity of the north and the cooling ocean breeze, when suddenly we came across a pile of opened green coconuts, a couple of brown, mature coconuts, and a cut bamboo trunk. 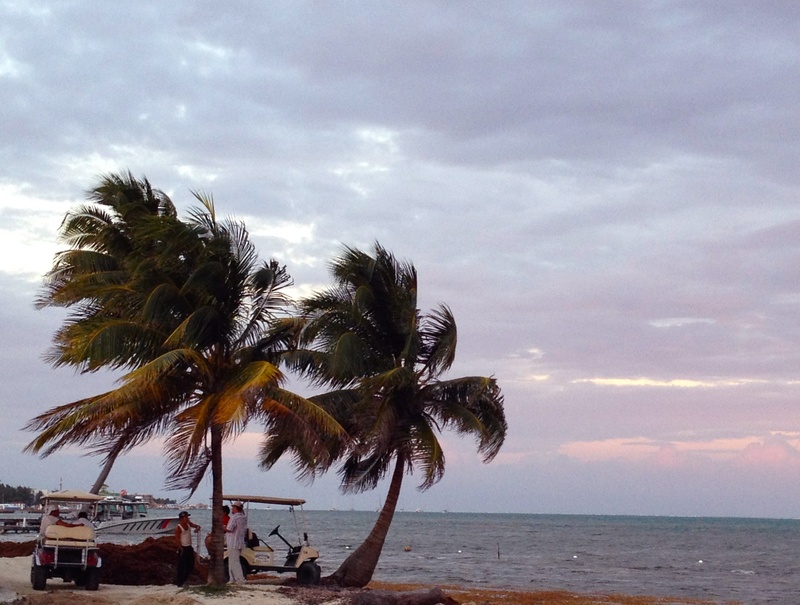 We looked up and saw one perfectly aged coconut dangling from the palm tree like a piñata. We grabbed the bamboo trunk and started to swing at the coconut. The bamboo trunk split after our fifth and sadly final blow. Determined to get this coconut, we picked up one of the waterless green coconut shells to throw at our dangling prize when two locals, a man and a woman, with a machete appeared. They smiled at us while asking what we were doing. As I started to explain, the locals chopped off the tops of the two coconuts they were holding, and handed them to us. Dan and I took a sip, which turned into large gulps. This refreshing, hydrating treat was exactly what Dan and I needed. Betty and her husband, the two locals, really knew how to pick their coconuts. While chatting with Betty and her husband, we mentioned we were looking for coconuts that could provide us milk for a recipe that we were going to make later that evening. 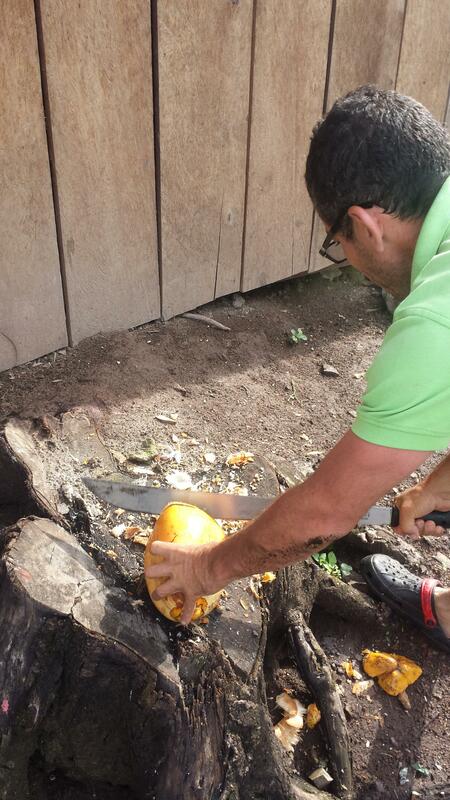 Betty’s husband worked his magic with his machete, husking the mature coconut and cutting it open. This, he mentioned, would make it easy to scoop out the meat when we returned back home. After some time, we finally said goodbye to our new friends, “the coconut gurus.” Betty told us to come back for a visit whenever we crave coconut water and want to spend a leisurely afternoon by the Caribbean waters. And we will. Good company, picturesque ambiance, and thirst-quenching coconut water are the recipe for a perfect Saturday afternoon on Ambergris Caye.